Do you want to avoid flying or do you just prefer to travel overland? Whatever the reason, it’s possible to cross the border from Malaysian Borneo to Indonesia without flying. If you’re coming from the Malaysian state of Sabah, you can travel overland (read: overwater) from the town of Tawau to either Nanakan or Tarakan in Indonesia. 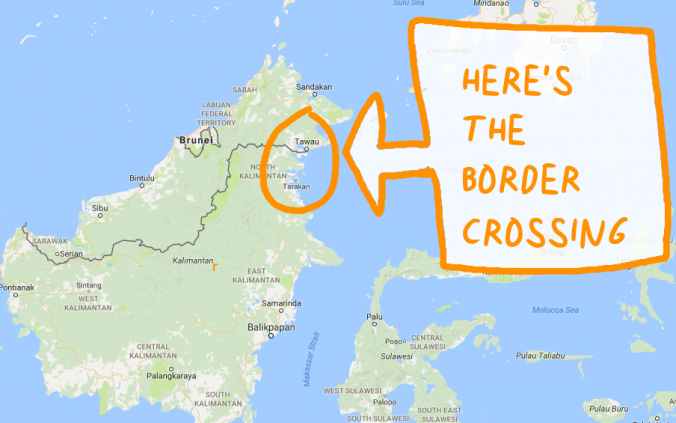 Here’s how you can make the crossing from Sabah to Kalimantan. If I had planned to write this post, I would have taken much better photos. Tawau, the border town on Malaysian side, has an Indonesian consulate where you can get a 2-month visa for Indonesia. The Indonesian Consulate in Tawau is open from 8 am to 4 pm with a lunch break after noon. Note that the consulate is closed on weekends. There’s not much to see in Tawau itself – trust me, I checked. Most travelers come to consulate on a bus from Semporna to Tawau. The 100 km journey takes more than two hours, so wake up early. The Indonesian Consulate of Tawau is more than 4 kilometers away from the bus station. My taxi from the ctiy center cost 10 Malaysian Ringgit (2.1 euros). The Lonely Planet guide praises the fast service of the consulate. According to Lonely Planet, “many travellers are in and out in an hour”. In my opinion, that’s the same as quoting the Marathon World Record when someone asks you how long it takes to travel 42 kilometers on foot. It took me four or five hours to get my visa, as the official who worked on my case spent three hours on a lunch break. Still, getting an Indonesian visa in Tawau is fair and simple. Just ask for help, and the English speaking members of the staff will guide you through. As the only foreigner in the building, I didn’t even need to wait for my turn like the locals – my visa application process began right as I arrived. The visa costs 190 MYR (40.5 €). I mean, just look at this! Why didn’t I take any pictures from the boat? Once you’ve had your Indonesian visa, you’re ready to cross the border from Sabah to Kalimantan. You might catch a boat on the same day if you rush from the consulate to the Tawau ferry terminal in the city center. If you’re not in a hurry, it’s easier to stay overnight and leave the following day. Boats from Tawau leave to two towns in Kalimantan, Indonesia: Nunukan and Tarakan. Nunukan is closer to the Malaysia-Indonesia border, and a boat ride there takes 1-2 hours. Tarakan is further south, and getting there takes at least four hours. There are more connections available from Tarakan, so that’s the more popular destination. However, note that boats don’t leave for Tarakan every day. 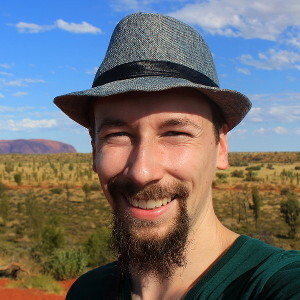 When I did the journey in February 2017, connections to Tarakan were only available on Tuesdays, Thursdays and… sorry, I don’t remember what the last one was. Saturday, perhaps? I traveled from Sabah to Kalimantan on a Wednesday, when all the boats left for Nunukan. 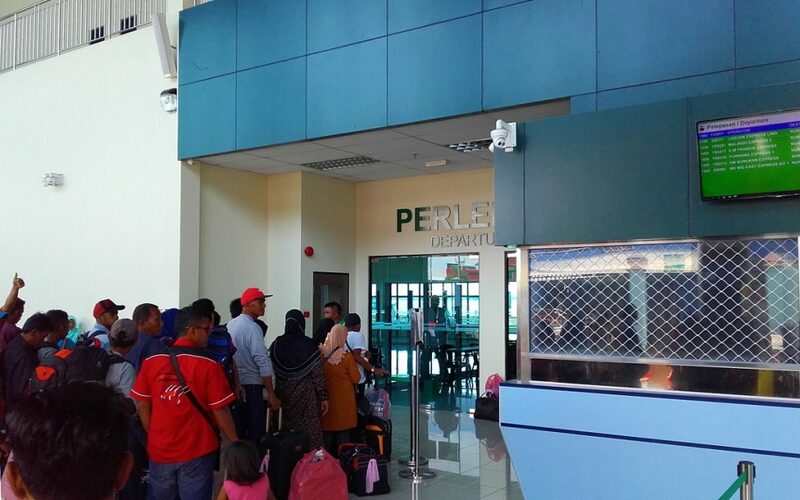 The new ferry terminal is very close to the city center, and there were several boats leaving from Tawau to Nunukan. If your luggage weights more than 10 kilograms, you have to pay extra for your luggage. I paid 90 MYR (19 €) for myself and a 15 kg backpack. Hotel Mariam, Nunukan. I didn’t even use my DSLR camera during the crossing from Sabah to Kalimantan. Since there’s little to see in Nunukan, you probably want to continue your journey right away. Unfortunately this is not always possible. When you arrive in Nunukan, Indonesia, bunch of local “guides” will offer to take you to the boat from Nunukan to Tarakan. The boats to Tarakan leave from a different terminal, so they’ll take you there on an angkot (Indonesian minibus). Just don’t get your hopes too high, because you might already be late. When I arrived in Nunukan, the last speed boat from Nunukan to Tarakan left at 1.30 PM. I missed the boat by 15 minutes. 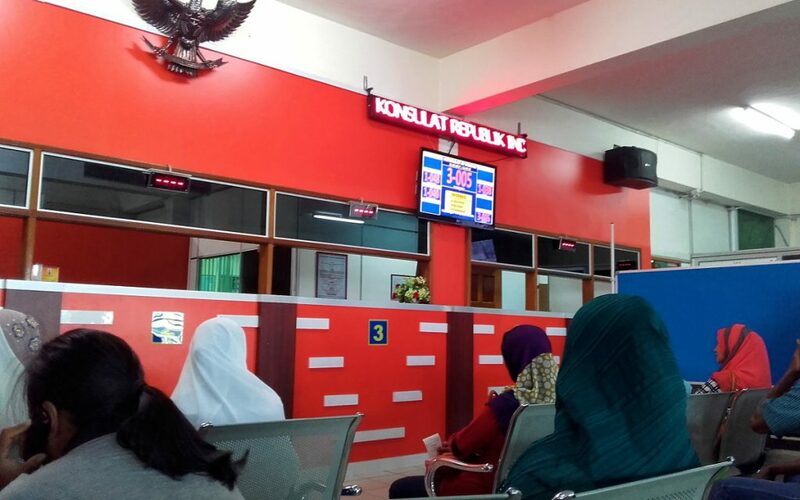 There’s an airport in Nunukan, so you can check if you can continue your crossing from Sabah to Kalimantan by plane. If this is not an option, you may need to stay in Nunukan overnight. My guide first took me to Hotel Fortuna, but this hotel is quite expensive – the cheapest room cost 350.000 Indonesian Rupiah (25 €). 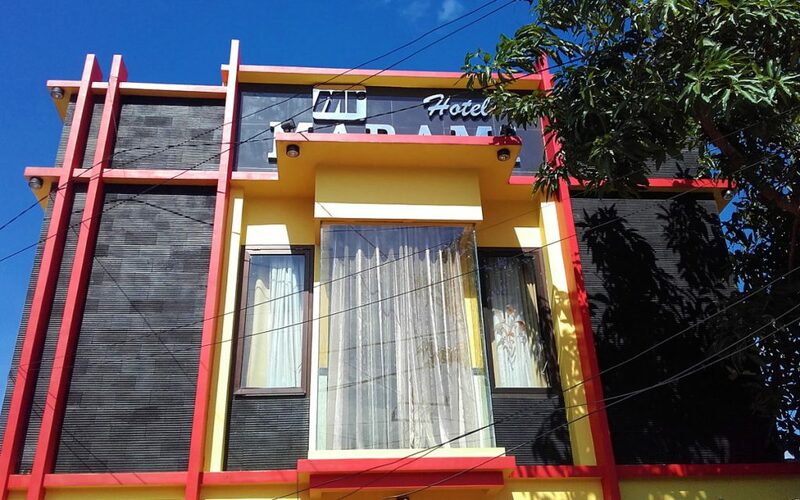 A cheaper hotel called Hotel Marami is nearby, just on the opposite corner of the Alun Kota (City Square). The cheapest room with a fan costs 150.000 IDR (10.6 €) for a night. If you don’t feel like exploring, there’s a nice local restaurant on one end of the square. You can also buy a local SIM card at a kiosk by the square. You can arrange that your local guide will pay your ticket and pick you up to the boat the following morning. While this makes things easier, it can also be quite expensive. The ticket to the speed boat from Nunukan to Tarakan costs 230.000 IDR (16 €), but the guide will ask you to pay over double the price. If you choose this option, bargain as much as you can. Tarakan, Indonesia. Wow, this picture looks super exciting. When you reach Nunukan or Tarakan, you have practically crossed from Sabah to Kalimantan. The Borneo border crossing from Malaysian Borneo to Indonesia is now over. Still, it’s quite likely that you want to move on as fast as possible. If you try to avoid flying, you might need to wait a while. The Lonely Planet guide mentions that Pelni ships has ferries from Tarakan and Nunukan to Balikpapan (a bigger city in East Kalimantan) – but it doesn’t mention how frequent these ferries are. When I checked the schedules, the next ferry from Tarakan to Balikpapan was almost two weeks away. In the end, I just decided to fly onward. There were several flights from Tarakan to Balikpapan available, so I booked a ticket online. My flight left in the evening, so I had plenty of time to walk through the main road of Tarakan. 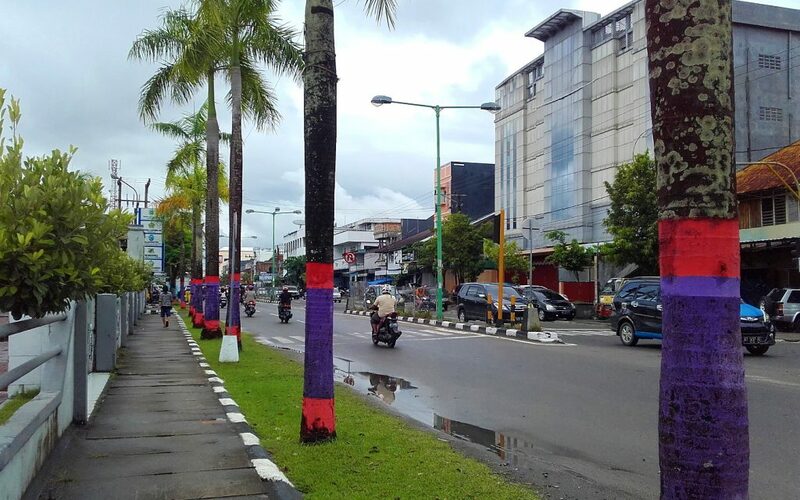 You might not find much to see in Tarakan, but at least there’s going to be one popular sight in the city: you. If you walk the 5 kilometers to the airport like I did, you get plenty of chances to interact with locals. I've grown to like these transition phases of my RTW trip. I'm slowly making my way along the east coast of Borneo, and I haven't seen any other tourists for a few days. It's clear that the locals haven't seen too many visitors, either. I've been walking on this road for less than 20 minutes, and I must have greeted over fifty people by now. Some even stop to shake hands and take selfies with me. Such is the life of the unknown celebrity. I like to ask you. According from your story that there have only Ferry from Tarakan to Balikpapan. Are they have ferry route to mainland according this coordinate ” 3.198240, 117.149062 ” ? @Shark Li Shan: From Tarakan to Balikpapan, there are sporadic (approx. every week or two) Pelni ferries. Otherwise, you can take a daily speedboat from Tarakan to Tanjung Selor on mainland Borneo, and from there a bus or shared taxi to Balikpapan. Thank you Daniel! 🙂 I updated the blog post now. And it is also easy if you wanna fly from Tarakan to Balikpapan. There are 3 flights every day and it is cheaper. it is just around 300 – 400 thousands rupiah.. Yes, that’s the flight I took in the end! Currently in Tawao on my Philippines reg’d dirt bike hoping to do this and a “Lap Around Borneo” ride, from Negros Philippines via Zamboanga-Sandakan ferry.